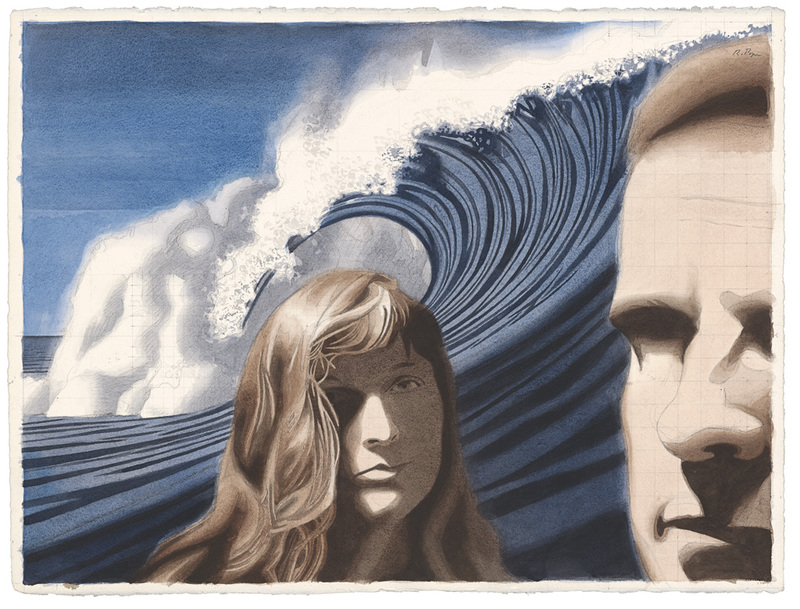 Water and ocean appear frequently in the art of Robert Pope. They reflect his need to connect images with a sense of place, his native Nova Scotia, a peninsula surrounded by the North Atlantic. The artist presents his environment as an ever-changing water-world, open to voyages of the imagination. This blog looks at different uses of this water imagery, and how these changes affect the meaning we read into them. Robert Pope. Study for Harbour, 1985. In this context, the word “metamorphosis” indicates the transformative power of love, both in its positive inspirational aspects and its obsessive, self-destructive aspects. The painting uses water as a symbol of this transformation. The crashing wave also alludes to Hokusai, the great Japanese artist (1760-1849) who worked in the genre known as ukiyo-e. Ukiyo-e translates as “pictures from the floating world,” meaning the in-between world, the not-quite respectable world of pleasure, travel and adventure opening up to the newly prosperous middle class. In Hokusai’s most famous image, The Great Wave off Kanagawa, Hokusai contrasts the violent and transitory effects of water with the calm permanence of the distant Mt. Fuji. Robert looked for similar contrasts in his own work, but with more of a focus on human psychology. In the studies at right for the painting Metamorphosis, the water’s abstract patterns turn a woman’s face into a jigsaw puzzle–a woman drowning in love. Smart writes how she “craves violence for expression, but can find none. There is no end. The drowning never ceases. The water submerges and blends, but I am not dead. O I am not dead. I am under the sea. The entire sea is on top of me.” (Elizabeth Smart, p. 118-119) The mood becomes darker here, though Robert’s image suggests birth as well as death. The water functions almost as a mask. Through psychological projection, the water becomes symbolic of a state of mind, the unconscious and its powerful effects on human character. Robert was being treated for cancer at this time. (He died in 1992 of the side effects of the treatment for Hodgkin’s Disease.) 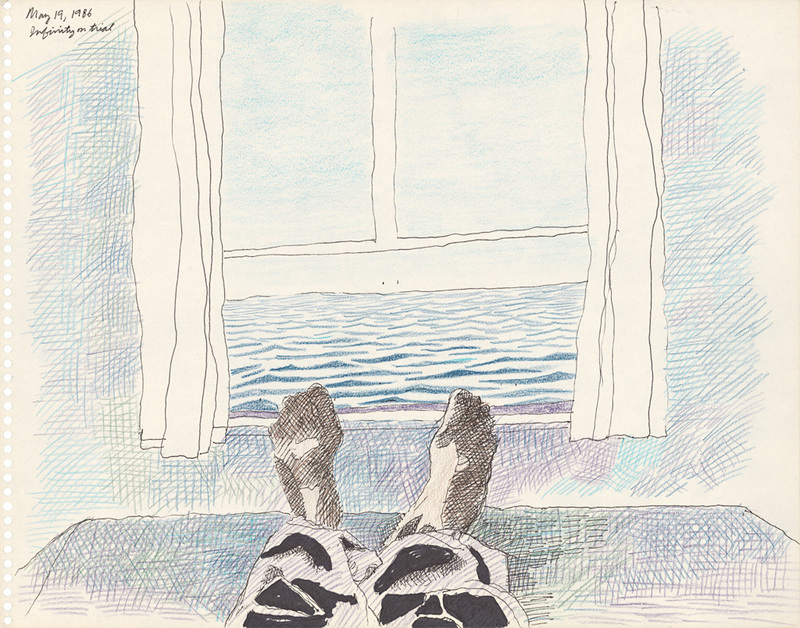 Above is a sketchbook drawing done from his hospital room in Princess Margaret’s Hospital in Toronto. He is dreaming of escape to another place, turning his confined room into the cabin of a fantastic ocean voyage. In Robert’s subsequent series “Illness and Healing,” the ocean landscape gives way to a hospital landscape filled with busy doctors, staff, technicians, patients and visiting family. Yet water imagery reappears in one key image. An I-V pole stands before a window, with the ocean visible beyond. 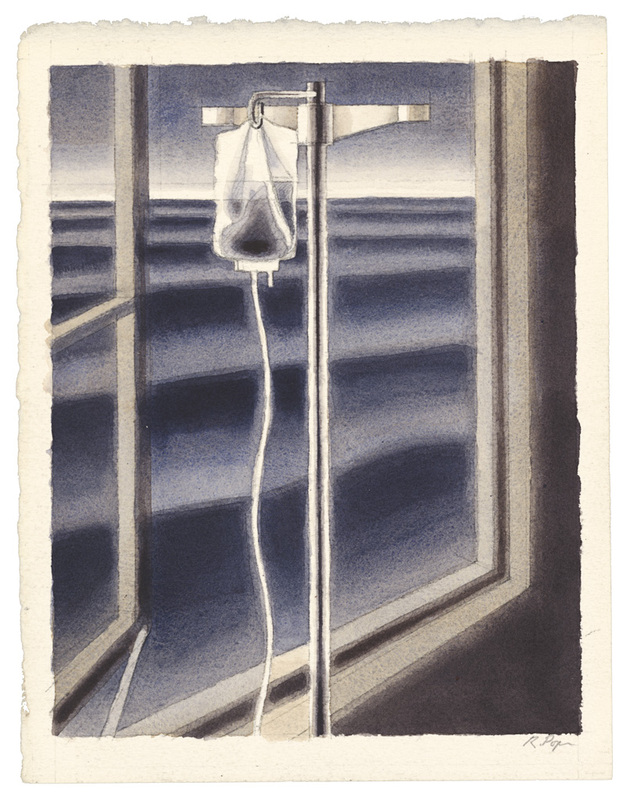 The painting contrasts interior with exterior, contrasts vertical pole with horizontal waves, contrasts medical instrument (science) with nature, contrasts the liquid in the solution bag (feeding into the patient’s bloodstream) with the limitless waters beyond. 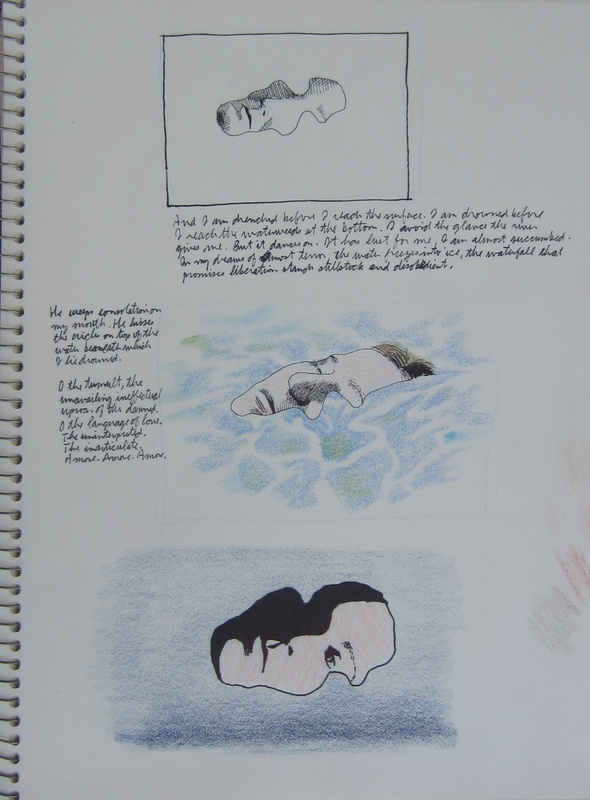 In a sketchbook Robert copied the passage: “God come down out of the eucalyptus tree outside my window, and tell me who will drown in so much blood.” (Elizabeth Smart, p. 35) Underneath, Robert noted: “Blood is a simultaneous symbol of birth, life and death. Water operates the same way, a life-giving substance that one can drown in.” The picture Intravenous Solution and Ocean shows no patient, but indicates a dream-like interior where an awkward instrument provides an artificial life-line. The image suggests end of life, which mysteriously may not be the end. The water encourages the viewer to think of infinity, continuity, cosmic forces transcending the limits of our perspective of individual being. 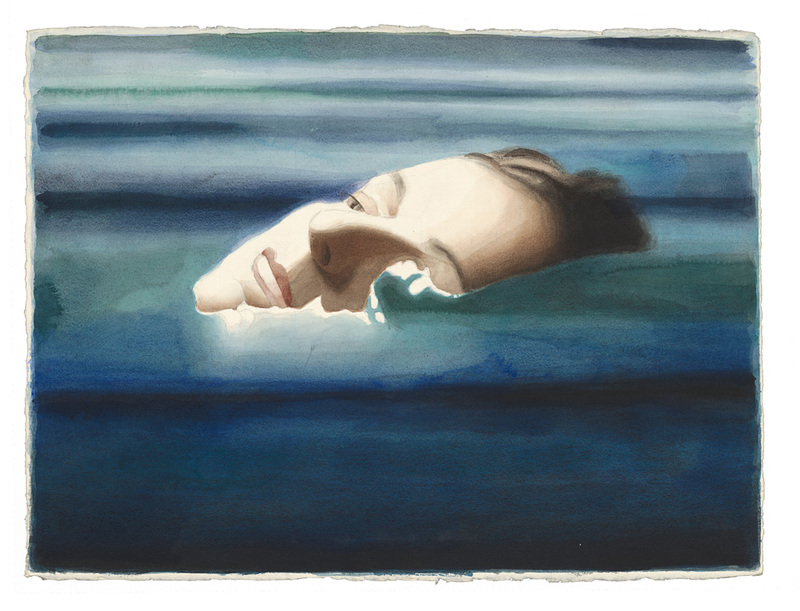 Water appears in different ways in the art of Robert Pope. Water provides a sense of place. Water is playful, transformative, unpredictable and dangerous. Water is composed of patterns that are hypnotic and graphically compelling. Water assists the psychological projection of mental states. 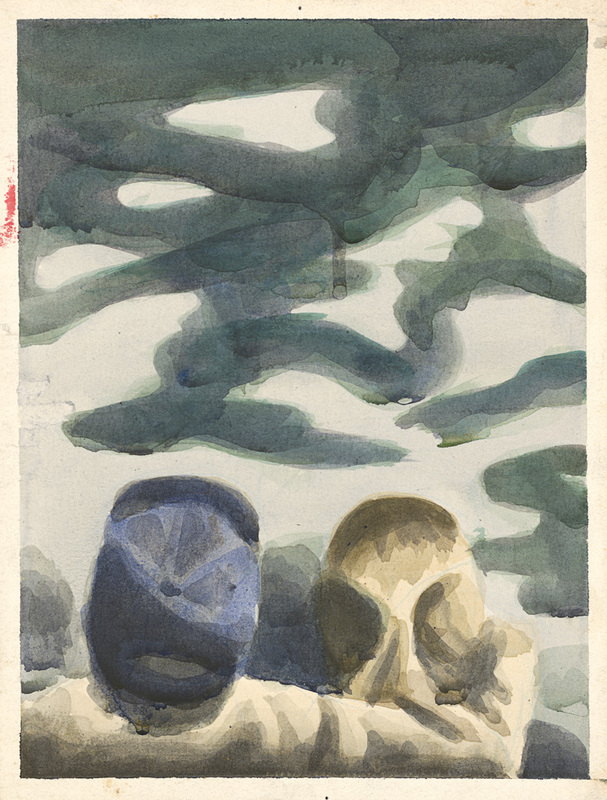 Water serves as a kind of mediation of unspeakable feelings between two figures. Water evokes a dream of escape, an invitation to daydream and imagination. Water suggests new perspectives on our fixed notions of time and being. These new perspectives have religious overtones, as well as being a statement of creative possibilities for artist and viewer. This entry was posted in Art and tagged canadian art, Robert Pope, water by dougcube. Bookmark the permalink.